In all, the city owes $50 million in parking bond debt through 2035. "Debt against the system is substantial," said Kingsolver. "Without having it all tied together (in one study), frankly I never knew that." The projections provide city officials with a new perspective: The parking enterprise fund cannot endure without major help. Instead, the city must find ways to subsidize the system -- likely through its general fund. The parking enterprise fund won't go in the hole 'til 2014 so there's a couple years for City officials to right this ship. Kamb paints a vivid picture of Tacoma's recent parking-related history. One startling stat is that City run parking lots and garages have seen usage go from 110% of capacity a few years ago down to 35% at peak times. So, if parking rates aren't going to go up who's going to get the ax to pay for all this? Is this a big "I told you so!" for off-street parking requirement opponents? Will you pitch in and pay for your parking twice? by NineInchNachos on 11/14/2011 @ 3:43pm can't they just steal money from the slip ramp fund? by KevinFreitas on 11/14/2011 @ 3:53pm So glad we (e.g. Erik Anderson) invested in all this surface-level parking. Not only does it hinder dense development but we can't even pay for it (or it can't pay for itself). Ugh. by fredo on 11/14/2011 @ 4:09pm The provision of parking garages is not part of the City of Tacoma's Comprehensive Transportation Strategy. It's not in the City Mission Statement nor is it in the List of Strategic Goals. Somebody has really pulled a fast one on the city council. Blame Eric Anderson if you want, but every council member pledged to make city government accountable. by KevinFreitas on 11/14/2011 @ 4:54pm I like agreeing with @fredo! Let's eject these languishing parking lots and structures and sell them off with the requirement that dense buildings to up in their place or community gardens/greenspaces. 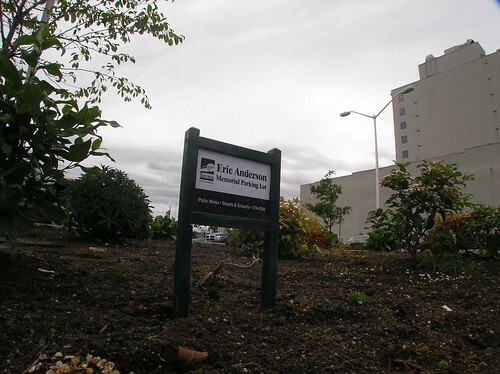 by ixia on 11/14/2011 @ 5:19pm Anderson refinanced parking bonds to fill the budget gap and left us with a seven million dollar hole just for this debacle. I wish he�d filled this hole instead of the one he filled for DaVita. Anderson�s parking obsession has been very negative on Tacoma. Too many city folks swallowed the bait - hook, line and sinker. Time to stop this crazy obsession over parking; don�t throw more good money after bad. by fredo on 11/14/2011 @ 5:27pm Ixia, there was plenty of public debate about the bond refinance at the time. The council should have known better but they agreed with the CM. The council voted FOR this refinancing. Impossible to blame Anderson for the council's lack of common sense and lack of courage. Other than that, I never have felt that owning parking lots or garages is a proper governmental function. Parking garages should be a private business venture, so the city get's all the tax revenue, and none of the risk Street parking should be city govt. responsibility.